Establishments in the wholesale trade – non-durable goods group sell items with a normal life expectancy of less than three years, including paper, newspapers, magazines, chemicals, textiles, footwear, groceries, petroleum and flowers. The industry employed more than 1.9 million people in 2011, according to the Bureau of Labor Statistics. That year, recordable injuries exceeded 81,000, and occurred at a rate of 4.4 per 100 full-time workers. 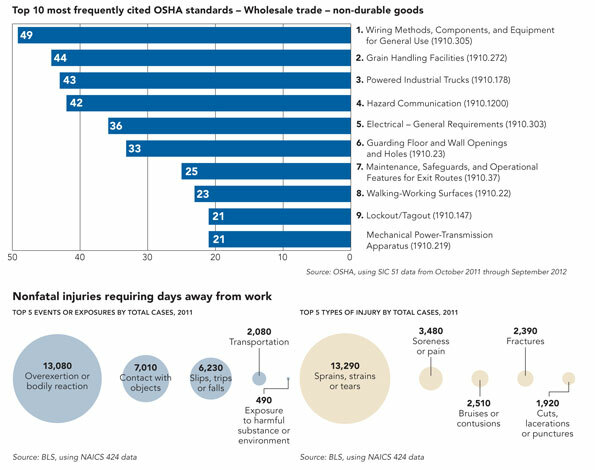 The rate for injuries involving days away from work, job restriction or transfer was 2.9.